Enjoying good wine in your own home is no longer a luxury, exclusive to the rich and wealthy, who have enough space and resources to transform entire rooms to wine cellars. Wine enthusiasts who cannot afford the high costs of building and maintaining their own wine cellars can have miniaturized versions of them in the form of freestanding wine cellars. What are Freestanding Wine Cellars? A wine cellar is essentially a storage room for wine bottles or barrels. Usually, the wine is stored for long periods. However, a wine cellar is not your ordinary storage room. Since the item being stored is wine, there are several factors that need to be controlled, and the most important ones are temperature and humidity. Variations in temperature and humidity have the tendency to cause the corks sealing the wine in the bottles to react adversely. They may expand or contract depending on the temperature and humidity, and if that happens, wine may oxidize, and the aging process will be hindered. Worse, there could be a leakage from the bottles. With this in mind, wine cellars have a built-in climate control system to ensure that the temperature inside the room remains stable and the humidity kept at an optimum level. This does not come cheap. A wine cellar the size of a large closet, with a capacity of at least 500 wine bottles, will require an investment of at least $4,000. We are talking about the construction of the climate-controlled cellar alone, meaning the materials and the technology. You also have to account for the cost of labor and, subsequently, the cost of the wine you will eventually store there. All in all, you might be looking at spending more than $ 10,000. So what’s the option that is cheaper, but will still let you have the joy of storing wine that you will enjoy later on? > Freestanding wine cellars. Freestanding wine cellars are freestanding appliances offering an economical and more ergonomic solution to the proper storage of wine, keeping it at a consistently cool temperature. Compared to your typical wine cellar, it is much smaller, usually the size of a refrigerator, but with similar wine storage technology, particularly on temperature and humidity control. 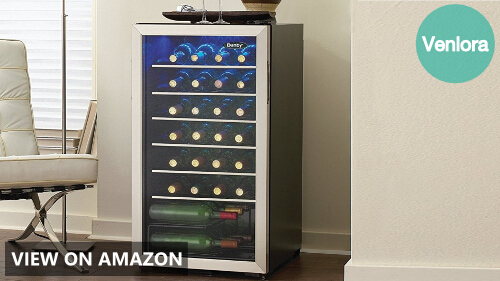 Freestanding wine coolers are not to be mistaken for built-in wine coolers. As the name suggests, freestanding wine coolers can stand on their own, which means that their dimensions will be up to the manufacturer’s best judgment. 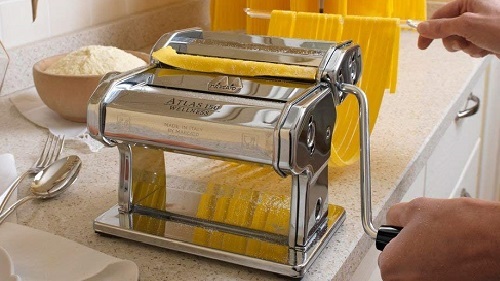 As a result, they may not fit perfectly under a kitchen counter or flush against other kitchen appliances or fixtures. Another significant difference lies in how built-in wine coolers have front vents so that they can be easily built into another appliance without the risk of overheating. Freestanding wine coolers, on the other hand, may have their vents on the sides or at the back, since they won’t be built into other appliances. Now you’re ready to invest in a freestanding wine cellar for your home, but you are at a loss where to start. Check out our top 5 freestanding wine cellars below. This Danby freestanding wine cooler has 3.3 cubic feet of cooling space, which opens up room for up to 36 bottles of wine. 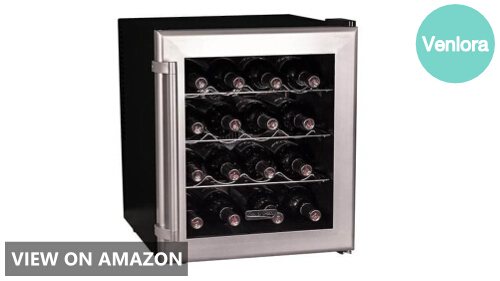 It has a temperature range of 6°C to 14°C (43°F to 57°F) – just the right range for proper wine storage. If you’re worried about ultraviolet rays getting to the bottles inside and wreaking havoc with the internal temperature, don’t be. The glass door is made of tempered glass, designed to keep radiation away from the wine bottles. This unit certainly does not fall short in terms of aesthetics. The stainless steel finish is complemented by the tempered-glass door, which is fitted with a reversible door swing for more convenience when opening or closing it. Inside, the blue LED interior lighting showcases each bottle of wine in their sleek black wire interior shelves – no incandescent bulbs in sight. 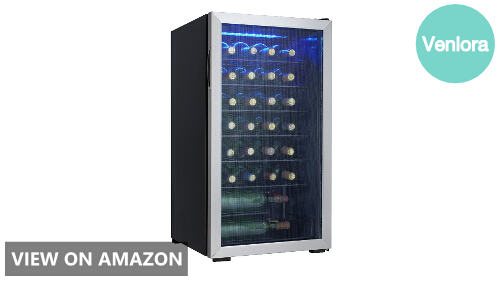 This Koldfront TWR160S wine cooler is ideal for new wine enthusiasts looking for a compact wine storage unit that can hold just over a dozen bottles. 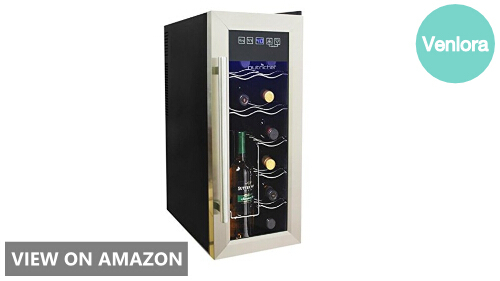 With a capacity of 16 bottles, it’s definitely an excellent starter unit. It features an adjustable thermostat, with an ideal temperature range of 11°C to 18°C (52°F to 64°F). Its internal fan also aids in stabilizing temperature and humidity levels inside the shelves. You won’t be disappointed by how stylish this freestanding wine cellar looks, with its stainless steel casing, slide-out scalloped chrome racks, reversible door, and LED interior lighting. Keep up to a dozen wine bottles in this thermoelectric wine cooler from Avanti that is compact and lightweight enough to be placed on top of your kitchen counter. The shelves are removable so you can adjust accordingly to make room for larger or smaller bottles, as applicable. Its thermoelectric cooling system ensures quiet and vibration-free operation, so that is one less thing to worry about. This also happens to be one of the more inexpensive models in the market today, so that’s definitely a consideration for those who are looking to buy their first freestanding wine cellars. 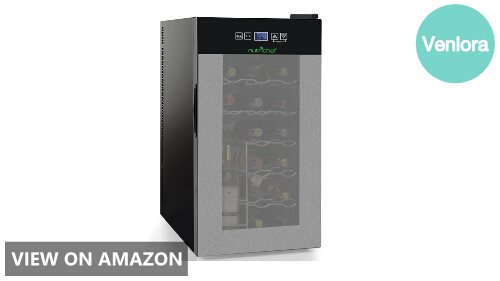 If you’re looking for a unit that will keep all your wine at the ideal cool temperature, you can trust this unit from NutriChef to do the job. Its powerful yet ultra-quiet thermoelectric cooling system is further aided by an adjustable temperature control and built-in circulation fan and ventilation grill that keeps the temperature ranging between 10°C and 18°C (50°F and 64°F). 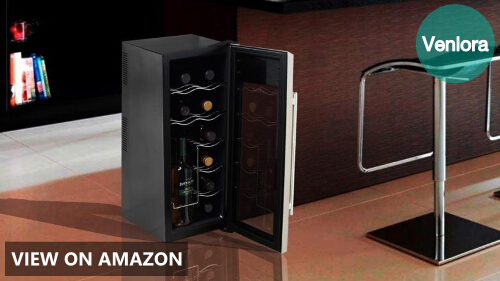 This stylish wine cellar comes with integrated LED lights, digital display panel, a glass door further secured by an air-tight seal and wine racks made of polished chrome. The housing is made of an engineered thermoplastic material, making it lightweight and durable. Its compact size also makes it a worthy addition to any room, whether it is placed on the floor or on top of a table or counter. 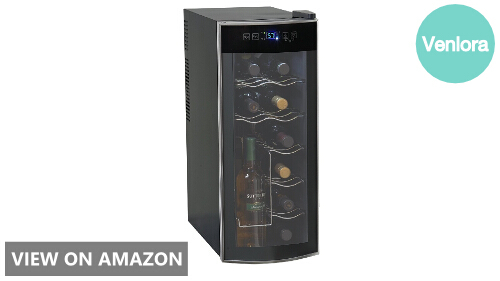 If the 12 Bottle unit by NutriChef was a bit too small for you and you want more room, then the NutriChef 18 Bottle Thermoelectric Wine Cooler Refrigerator is the most logical choice. It offers more room for more bottles while remaining compact and lightweight enough to be placed on a countertop. This unit retains the ultra-quiet operation and the precision thermoelectric cooling technology. It kept the air-tight seal on the door, but this time, it comes with a smoked glass, adding more sophistication to what was already an elegant look. The unit’s energy efficiency is worth noting, too. Thanks to its digital touch button display, you can easily change the settings without having to open or close the door repeatedly, consuming more energy in the process. 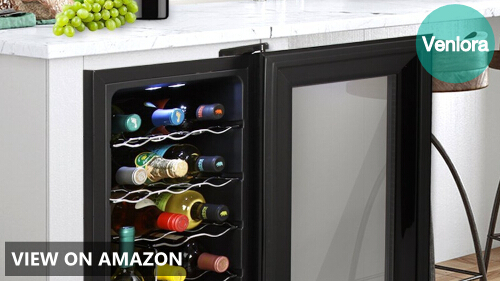 You can either go for a wine cooler with a Single Zone Cooling or a Dual Zone Cooling mechanism. The choice will depend on your wine preferences. Freestanding wine cellars with single zone cooling are the perfect starter wine coolers for people who are only starting to get acquainted with wine and would like to start slow or wine lovers who have a clear preference for one type of wine over the other. For example, you may prefer only whites, so you would want to only store whites in your chiller. In that case, a wine cooler with only one cooling area and a single temperature cooler would be the more reasonable choice. However, if you plan to grow your collection, or you are partial to both reds and whites, you may want to go for units with dual zone cooling. Generally, the bigger the unit, the higher its capacity. However, due to design techniques by manufacturers of freestanding wine cellars, that may not always be the case. If you don’t have much room in your kitchen, getting a countertop unit would be a good idea. 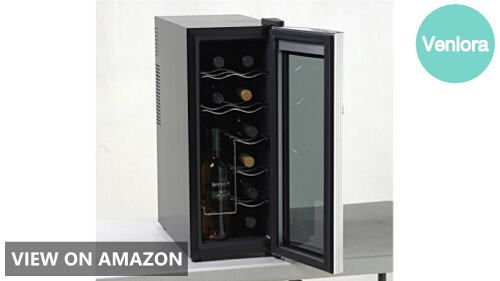 Or, if you are looking for a wine cooler for your office and you want one to fit just under your table, you’d look for something compact and lightweight. Of course, if you have more room and you want to make it a centerpiece in your kitchen or living room, then feel free to look for the bigger and more ornate options. Capacity could be in terms of liters or bottles, although more units specify the number of bottles that they can hold. A freestanding wine cellar can hold anywhere from a dozen to three dozen (sometimes, even more) of wine bottles. Decide on what you need, and go from there. 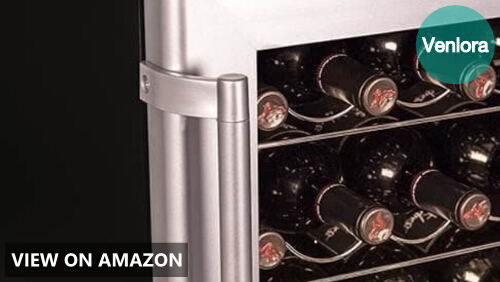 The noise factor is often a deal breaker among people looking for a wine cooler. Ideally, what you would want is a freestanding wine cellar with a cooling system that does its job well, without making too much noise and without too much vibration. 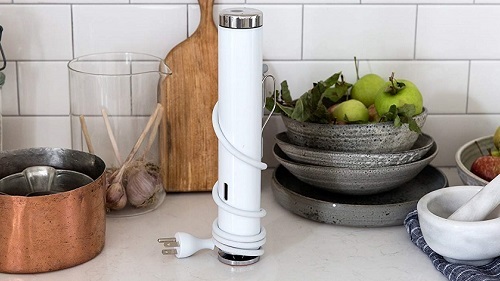 This is especially important if you want to set it up on top of your kitchen counter or a corner table at your home office. 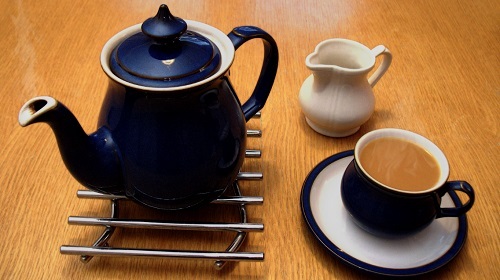 Another thing to look into is whether the cooling system of the unit is energy-efficient or not. It won’t make sense to buy a unit at a cheap price, only to end up paying high energy costs every month due to inefficiency. Many manufacturers offer warranty options for their units. Choose one that is reasonable, and if possible, find one that also offers after-sales service, in case you’d require repairs and maintenance of your unit in the future.